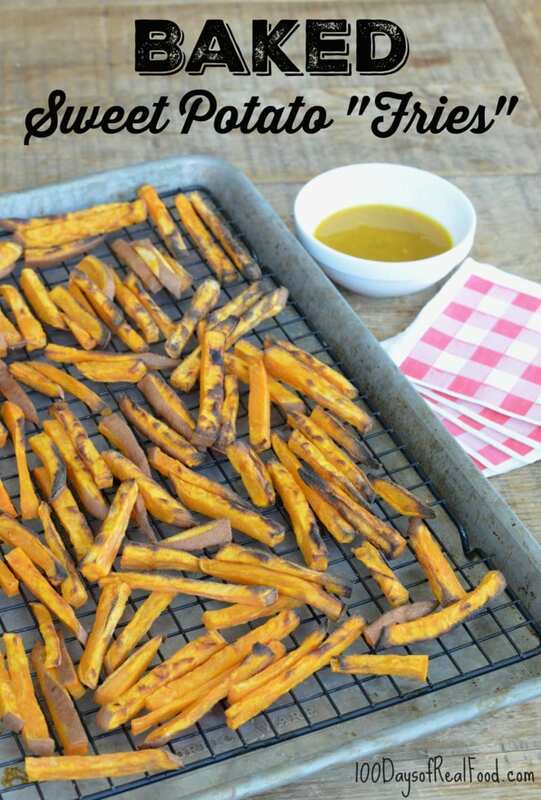 If you love sweet potatoes you’ll love this healthy alternative to traditional french fries. 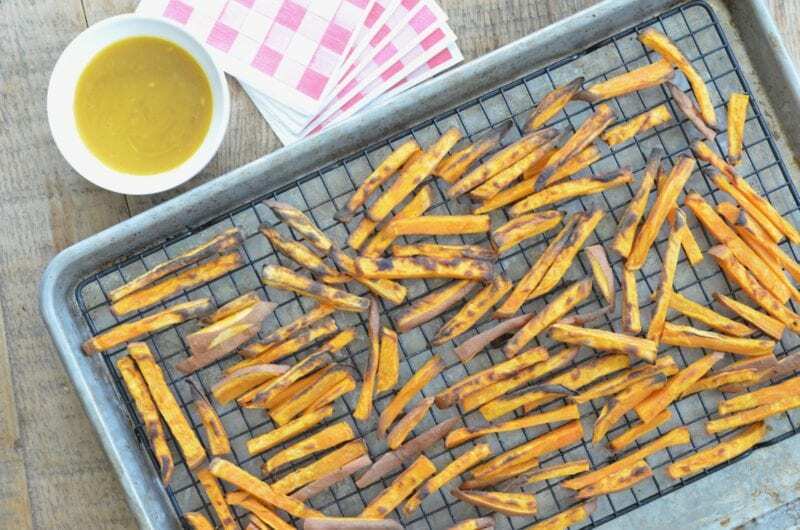 Now, these baked sweet potato fries won’t be quite as crispy as their deep-fried counterpart, but I’ve found elevating them on a rack while baking helps! They sure do hit the spot, especially when served with some homemade honey mustard (or homemade ketchup or BBQ sauce if you’d like) for a dipping sauce. If you are looking for some extra kick, you can add ground black pepper, garlic powder, cayenne pepper, or whatever other seasonings you like. Enjoy! Preheat oven to 425°F. Arrange the rack on top of the baking sheet and set aside. Uniformly chop the unpeeled potatoes into ¼- to ½-fry-shaped sticks. Throw them into a large bag or large bowl and shake them up with the oil and salt to coat them thoroughly. Spread the potato pieces evenly in a single layer on the rack. Divide between two baking sheets if necessary. Bake for 18 to 20 minutes (swapping around baking sheets halfway through if using more than one), then turn the oven up to a high broil and bake for 2 to 4 minutes more, until golden brown. Mix together the honey and mustard and serve alongside fries as a dipping sauce. I am having a hard time understanding the directions in this recipe….”Arrange the rack on top of the baking sheet and set aside.” What does that mean? P. S. I love your recipes! They have changed the way I cook. There’s a picture. The cooling rack is sitting in the baking sheet. You put the cut, seasoned potatoes on the rack in the baking sheet. 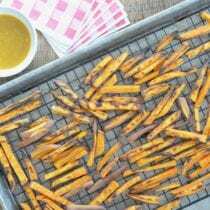 It always sounds like such an easy step “uniformly chop the sweet potatoes into sticks”. I virtually need a meat cleaver and a well-muscled arm to chop sweet potatoes. Is there some trick to make this step easier? I always toss my oven fries, both regular and sweet potato, in lightly beaten egg white and spritz them with avocado oil. This makes them more crisp and holds on the spices. Just bake them on parchment for non-stick and easy clean up. Soggy fries are no fun! That’s a good idea! I’ll have to try it. If you partially cook the sweet potato, in the microwave or oven, then they will be softer making it easier to peal and cut. My husband and I make these with all the seasonings listed and a real mayo/siracha (1/3 ratio) dipping sauce. They are delicious! Our family raves about them. I also love making them in my air fryer. I think they get a little crispier in the air fryer.